Directions: Preheat oven to 350º. Grease 8 individual baking dishes or ramekins. Combine all ingredients and divide between dishes. Bake 20 minutes or until center is solid and puffy. Directions: Scramble eggs with salt and pepper to taste. Cook over medium heat until thoroughly cooked. Spread cooked corn tortilla with warmed refried beans. Top with warmed potatoes and shredded lettuce. Add scrambled eggs and garnish with cilantro. Serve with salsa. Real Mexican Quesadillas are nothing like this, but I think these are much better. Directions: Warm flour tortillas on grill. Sprinkle each tortilla with grated cheese. Separately, scramble eggs with chilies. Spread two scrambled eggs over each tortilla and sprinkle cilantro over the top. Close. Cut into four triangles. Garnish with cilantro. Serve with guacamole and salsa (optional). Directions: Break eggs into bowl and mix with jalapeño peppers. Pour eggs into omelet pan and cook until set. Place flat omelet onto flour tortilla and sprinkle with cheese. Fold in half. Cut into thirds. Grill tortillas on both sides to warm and melt cheese. Sprinkle with chili powder. Serve with melon salsa on the side. For salsa: Mix all ingredients together. Refrigerate. Preheat oven to 350ºF. In a greased 7 × 11 baking dish, layer split chiles and Jack cheese. Combine eggs, corn, milk, flour, baking powder and garlic salt; mix well. Pour over chiles, top with Cheddar cheese. Bake at 350ºF for 30 minutes until puffed and browned. Serve with Salsa. We're convinced that it's the Mexican Vanilla that makes a difference in these pancakes. Directions: Sift dry ingredients together. Beat eggs until light. Beat in milk, butter or oil, mashed banana and vanilla. Make a well in the center of the dry ingredients and pour egg mixture into it. Quickly stir wet and dry ingredients together until just blended. If too thick, add more milk, a spoonful at a time. Heat griddle over medium-low heat and brush with melted butter. Pour batter by spoonfuls onto the griddle. Cook until bubbles appear all over the surface. Turn. Top should be evenly browned. Continue cooking until browned on the bottom as well. 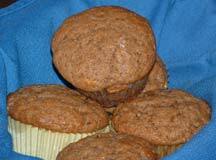 These muffins are great hot right out of the oven or as a leftover in a packed lunch. Sometimes I only have 2 bananas so use pineapple, papaya or left over mangoes to fill in the remaining fruit. Since there is no water added it's important to have the right amount of liquid volume from the fruit. Directions: Sift dry ingredients together in a large bowl. Whisk together liquid ingredients and add to dry. Stir until just moistened. Do not overmix. Divide the batter into 12 muffin tins lined with paper. Bake 375 F or until a toothpick comes out clean. Let cool about 5 minutes and serve.